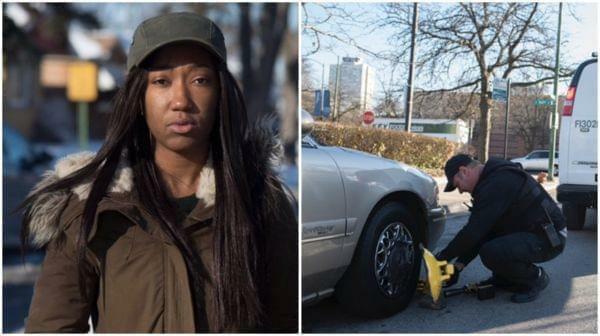 Left: Laqueanda Reneau filed for Chapter 13 bankruptcy last year to cope with the debt from unpaid Chicago parking and traffic camera tickets.Right: A wheel clamp known as a “Denver boot” is put underneath a car. On The 21st: A ProPublica Illinois investigation looks into the way some black motorists in Chicago are driven into backruptcy because of the way the city addresses parking tickets. Plus, we dive into the best movies in Illinois—at least, according to a poll by the Abraham Lincoln Presidential Library and Museum.